Genuine original Samsung Galaxy Tab 3 8.0 inch lithium ion replacement battery. If your Samsung Galaxy Tab 3 8.0 does not hold the charge like it used to, it may be time for a new battery. 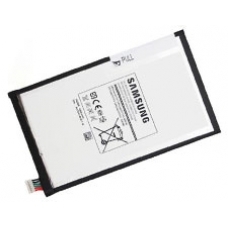 This is an genuine original Samsung Galaxy Tab 3 8.0 battery part (T4450E) as specified by the manufacturer Samsung. * Voltage: 3.8V, 4450 mAh.